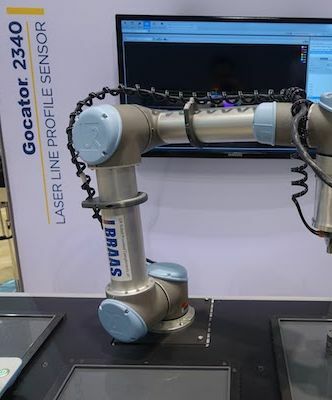 By using 3D smart sensors with onboard software, an industrial robot can perform this task autonomously—something that could previously only be done by a skilled worker. 1. Pick-and-place to stack and unstack target objects, similar to a palletizing or de-palletizing application. 2. Random placement and picking up off of a moving conveyor. 3. Placing objects into structured bins by height of the parts, at 1, 2, 3, and 4 stacks high. The three applications listed above cover the majority of the real-world examples where 3D can be used in automated manufacturing. 1. Pick-and-place of incoming raw materials or subassemblies traveling on pallets. Objects are scanned with Gocator. The sensor reports the object position and directs the robot to place the object randomly or directly on a conveyor. 2. Objects are scanned again as they travel down the conveyor, and then picked up by the robot and placed into an appropriate bin. 3. Finished products are scanned and then stacked/re-stacked/palletized. For further information on the new system, click here.